We anchored off Pool Flat . This is deep and ideal for bow anchors out into sand and stern back into the sea wall. Friday2nd Dec Arrive lunch time first group. Afternoon bushwalk to Winifred falls (or other). 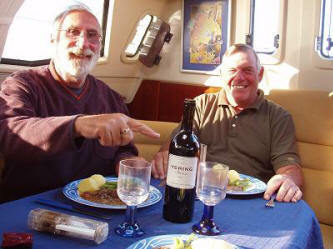 Saturday3rd Dec11:00 Breakfast aboard own boats. Morning boating behind the weir/walking to park office etc. Picnic lunch at Pool Flats. High Tide - farewell the Sunday leavers. The Broadwater Classic was run at 12 noon in ideal conditions. A good fleet of 12 yachts competed. The places were; 1st Marritti, 2nd Pied Piper and 3rd Sweet Talker. Boats Attended; Sail la Vie (Keith and Lyndal) Wilson, Emphasis (Dave and Eliz Perry), Carpe Diem (Roger and Janice Phair), Sweet Talker (Kevin and Jeni Everitt), Kalina (Ken and Libby Teiffel), Sail la Vie (Keith and Lyndal) Wilson, Sunflower (Teiffel's/Cole's), Marritti (Paul Hammond and crew), Commin Thru (Craig Smith), Celeste (John Wren), L'attitude (John and Margaret Barter), Reflections (Dave and Dot Hammond), Pier Piper (Tony and Christine Towndrow), Second Wind (Don and Elizabeth Parker). Unfortunately Scott from Navman rang in sick. Imogen is over a hundred year old and has had a very interesting life. The Mistress's Mystery Medal was presented which consisted of a commemorative stamp with indelible ink so that these medals can be attached to your Trim flags. Participating Trims will need to present their flags to receive the Medal. Had a slow start due to ropes around prop of Imogen. Imogen was the official transporters for the Broadwater trims. The Master was probably responsible for this. Once assembled at the Deeban spit we broke out the champagne and nibbles and heard some of the historical background to the area we were about to enter into. Some of the information was in a handout by the Master and much was contributed by such notable celebrities as; Sir Angus Attenborough , Lord Leyland, Sir David Googley and others. We heard about the origins of the Basin, the grazing lands ( described by an old lady from Point Turriell opposite) that originally formed Deeban Spit. An account was given by the grandson of one of the early Shell-gritters, the plans for a Tombolo and the legacy we now share. 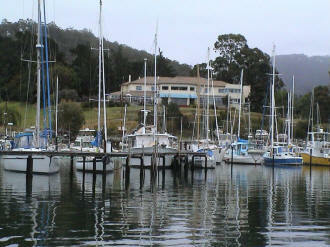 These accounts will be written up fully as a new chapter in the cruising guide to Port Hacking. The group then proceeded towards the fish hatchery down the Deeban channel and under a bridge which may have been one of the sluice gates for the hatchery, but now carries the water line to Bundeena. A little bit of pulling was required to negotiate the sand to the drop-off into the deep water of the basin. 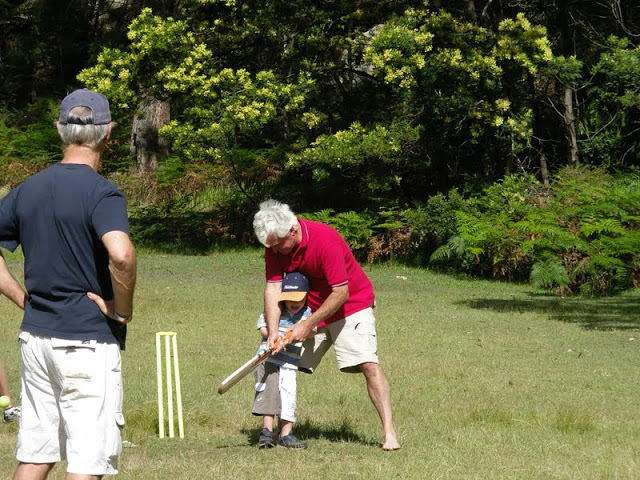 The morning tea spot was a little behind schedule and the Master was challenge over the need to move on. The Master is used to this kind of decent and suitably ignored the advise and everybody enjoyed the break until the stragglers caught up. During tea and refreshments introductions were made and a description was given about the hidden river we were about to explore to the head of navigable water. So off we set for the final ascent on the wildflowers. We had a wonderful trip with interesting obstacles placed in our way. Most were able to overcome with a little ingenuity, however, the Master again had to move on a number of Trims who may have given up before reaching our goal. 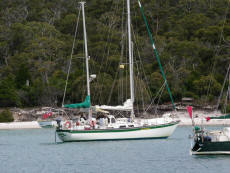 The picnic spot was a large flat rock about 100 metres beyond were we left the boats. that was totally surrounded by the most impressive and profuse wild flower show that you could possible imagine. Please see the slide show to have some idea of the range and depth of the flowers. The picnic was had in fine style, with most of the party producing rugs, table clothes silver goblets for their wine and the Kalina's even produced a silver candelabra complete with candle. It's nice to see things done in style, and maybe the Master is listened to occasionally. After lunch Marianne Gibson gave us a description and the full names of the flowers surrounding us. 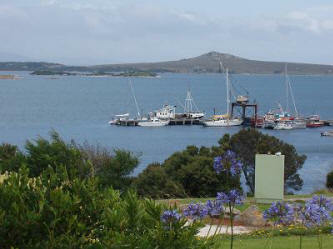 I hope I can include this segment in the guide to Port Hacking. 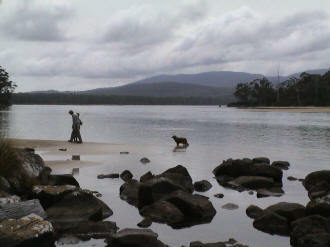 The excursion to Cabbage Tree Creek was terrific. 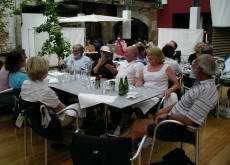 The little talks by knowledgeable folks and 'guest speakers' certainly added to the interest and enjoyment. Chasing after errant dinghies being blown off the beach did hamper the talks a little though (must remember to put down better anchor next time). Although all muscles are aching today it was a great outing, thoroughly enjoyable. A very good roll up for the final chapter of the cruise to Van Diemans Land by the intrepid trio. The story took us though a brief tour of the Botanical gardens, the air walk and some vineyards before meeting up with friends for the Wooden boat festival. Then it was time to return via the inside channel past Dunalley through the Dennison channel, inside Maria Island then through the Schouten Passage on our way to Wine Glass bay for the night. The following day saw us return to St Helens were we decided the weather looked good for a direct crossing to Eden, with a safe haven available at Lady Baron Harbour should we need it. The crossing was fine but the section though the Cook Straights was a little like sailing through a washing machine. Dinner was taken in stainless steel pots. 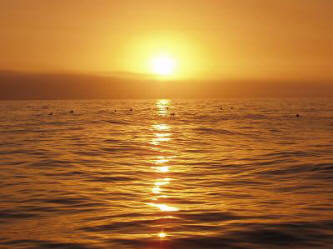 However, by nightfall the sea had settled and so did we for the night watches across the straight. We arrived at Eden at 7:30 pm having completed the 300nM in 36 hours. 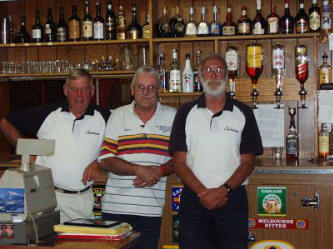 The Broadwater Classic was cancelled due to the unfavourable weather forecast. However, the BBQ/social was held at Broadwater Yacht Club around 12:00 to 12:30 and accessible by land yachts at 1 Wareemba Place, Lilli Pilli. Phone 9524 0042 or Mobile 0418253479. Boats attending; Carpe Diem (Roger and Janice Phair), Sweet Talker (Kevin and Jeni Everitt, Ryan and Elisa Everitt), Kalina (Ken and Libby Teiffel), L'attitude (John and Margaret barter), Sunflower (Ian and Margaret Coles/Fred and Gwen Teiffel). A cold start with winds a little higher than expected, however, the skies were clear and not a cloud in the sky. The muster with last minute updates didn't happen as the horse bolted and all were on our way. (It's generally an uncontrollable lot). Confirmation came back from the front runner (Esprit) that our marks were still in place and thanks to quadruple redundancy of the balloons we still had marks to leave by. The second rule of cruising is "Not to make plans" so after unsuccessfully attempting to moor as per instructions, we all had a good time completing the operation in near chaos. 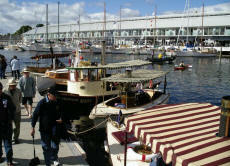 In true fashion the Harbour Master was largely ignored but did have some grateful customers. The day just got better and better. The sky was a brilliant blue, the temperature soared, and many boats almost forgot to have lunch (over relaxing on Rhumb). It was a hard task transferring the crews ashore and the Master met with much opposition but prevailed in the end. You can't go to such a beautiful location as this and not feel the sand through your toes. This provided us with an opportunity to exchange some wine over a few yarns and take some group photos before heading home. 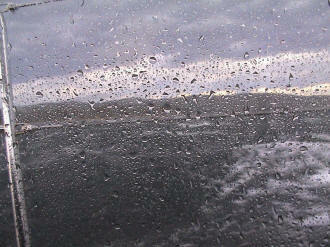 The wind was much kinder on the return trip and I guess most boats saw the sun set as they picked up their moorings. Thanks master for a great day, sorry we had to leave early, Daniels partner is expecting in a few weeks and we were out of range on the mobiles. Thanks again we had a great day an are looking forward to the next cruise. Good morning Master, you certainly maintained your links with Huie. Well what could one say, was yesterday the best cruise yet, or are they all fantastic. From the Splinter crew, many thanks for all your efforts we had a ball. 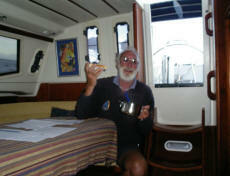 Greetings Master, Another successful Cruising Group sojourn and magic weather to boot. We, and I am sure all others, certainly appreciated your planning and preparation for the Wattamolla entrance and anchorage. All hands in Rhumb Line had a magic day and returned safely to Port well nourished and hydrated with all sorts of beverages various. We had a great day, walked out from home to cars covered in ice, the thermometer had dropped to minus 1degree during the night.. Yes we do still live in Caringbah not Canberra. 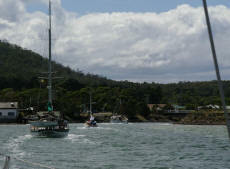 We boarded little Kalina and headed down the coast accompanied by Margaret and Ian Coles. Although Ian had many goose bumps on his legs due to the fact he had worn shorts, he adamantly claimed he was not cold. 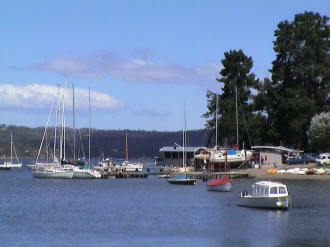 We negotiated the entrance to Wattamolla with no problems and dropped anchor and enjoyed what was a magic day. Photos prove it. Hello Master A short note to say many thanks on behalf of Janice and I.
John You were right it is a terrific spot. Toni and I want to thank you for such a great and well organised day what with the marker buoys and Gus there offering to take the stern anchor, not to mention the antics of Kevin and crew on Splinter who were rafted up to us. Dear John and Ken, Attached find some pictures taken by Margaret and myself. Thanks for a great day looking forward to the next one. The sea kayaker is my mate Howard. They left a bit before us and stopped at Little Marley beach for breakfast. He watched us sail past and arrived just after we anchored up. Hi John, Thanks for organising another splendid event! Good Evening Master, Yesterday was our first cruising trip with the cruising club and to say I was a little apprehensive was an understatement. But thank you for such a wonderful experience. The trip from Jibbon to Wattamolla was an experience we will never forget, our mascots were absolutely delightful! We had to take off early to reach our mooring in Galwey Bay by sunset. Boats Participated (19); Splinter (Kevin Swadling and cast of a thousand), L'attitude (John and Margaret Barter), Kalina (Ken and Libby Teiffel), Emphasis (Dave and Liz Perry), Griffin (Gordon and Toni Stewart and crew), Wanda (Sven Suivi and crew), Sweet Talker (Kevin and Jeni Everitt), Rhumb Line (Jim and Jinny Lupton), Esprit (Tony and Elizabeth Galwey), Durham (Alistair, Alison and son Rory Rowe), Storey Teller (Michael and Elaine Carolin)), Third Man (Kevin and Elaine Oldfield), Flashdance (Brian Googs Evans), Carpe Diem (Roger and Janice Phair, Scott and Kim Toolin) Sea Change (Ian and Rhonda Colman) Cut Loose (Jeff Eason and company) Sarsala (Amanda and Rob Milner), Celeste (John Wren and crew), Mirage (Cheryl and David Bannell). The fabulous exploits of L'attitude were again an inspiration to the gathered audience. 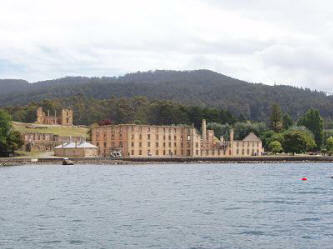 The trip this time started at Port Arthur and after a short stay in Hobart set forth for a discovery cruise through the D'Entrecasteaux Channel and the Huon River. The intrepid sailors from L'attitude were assisted by Jon from Emmanuel who was able to offer warnings for all the danger spots, including the most notorious of them all - The Oyster Bay Inn. Jon has entered the local folk lore there as being the only person in living memory that has made a May Day call from a dingy. The fabulous guest speakers turned out to be Ken Teiffel, the Master and the Mistress. 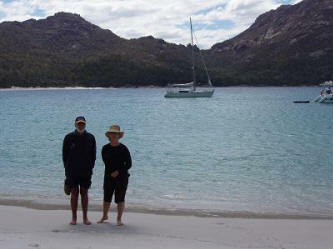 They gave a wonderful account of their recent cruise to Tasmania. 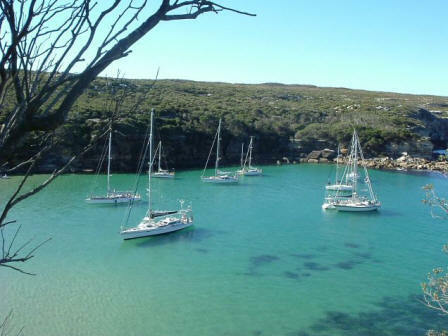 It was a masterful account of good planning and seamanship which took the intrepid travellers across the Paddock (Bass Straight) via Flinders Island, Cape Barron Island thence Cook Straight to St Helens. Their stories and anecdotes were an inspiration to the audience which were held in awe during the whole performance. The trip was a combination of Calms seas, good and plentiful food (lobster of course and Tasmanian reds) and entertainment by the locals. The trip unfortunately had to end at Port Arthur due to time constraint - but after much pleading by the audience the trio agreed to continue their trip at the next meeting. Queens Birthday Whale Watch and Raft-up. A perfect day and a good rollup. 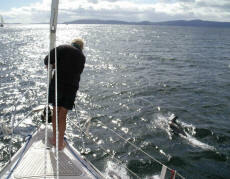 The whales remained hidden for a while - but when they appeared, what a spectacle. As a result, lunch was delayed a little, but in true cruising style adjustments were made to make the event an outstanding success. Most boats returned just as the sun was setting. You can't time it much better than this. Thanks for organizing a great day. Missed seeing the whales, but soaked up plenty of sun over lunch with friends. 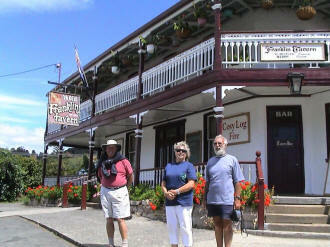 Will try and make meeting on 21st, Russell and Jan Barnes (Comfort Zone). 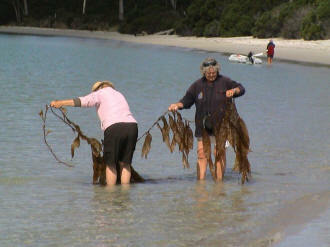 Gee John, we went back out to-day and picked a pot of 4 possible 6 and when with them to Cape Bailey. Got heaps of photos from to-day. I think Phil also on Splinter got a Tail shot, just in case nobody else's has got one from yesterday. Yesterday sure was a great day, one of the best. Many, many thanks. cheers, Splinter. Good morning Master, Congratulations on organising such a magic day and raft up venue. You seem to have some influence in certain areas, although the water temp could have been adjusted up some ten degrees for the intrepid unsynchronised swimmers. Although we did not get so see the spouters we certainly did enjoy the day and look forward to future cruises with the group. Best regards, aye, Jim Lupton and Crew, (Rhumb Line). John, Here are a couple of shots not the best but then I only had my little camera. Thanks for a great day. Libby (Kalina). Thanks for organising the Whale watch cruise , I've been lucky to see whales in the bay on our last 3 outings. I bought 'Durham' 1 year ago , its a 2000 Jeaneau model Sun Odyssey 29.2. We named it after our home town in the UK, its 15kms south of Newcastle. Regards Alistair, Alison and son Rory 9. Hello Master, Congrats on a great whale watching success. Sorry we couldn't make it. 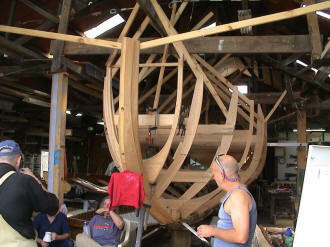 Third Man - Kevin, Elaine, Peter, Wendy Oldfield, Celeste - John and crew Wren, Avanti - Bruce McKay and Crew. 8 Pied Piper (Tony Towndrow and Co), 9 Morning Glory (Paul Melling). CSC and RMYC member please note: A Combined Offshore Committee was set up with representatives from CSC and RMYC. 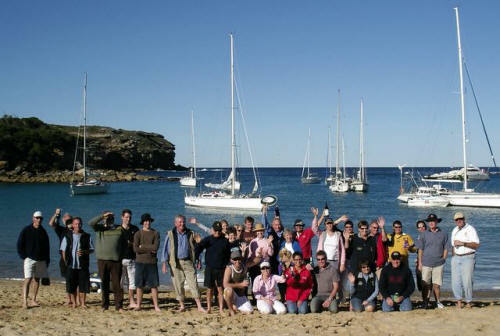 A rules and sailing information night with the experts from Ullman Sails took place. 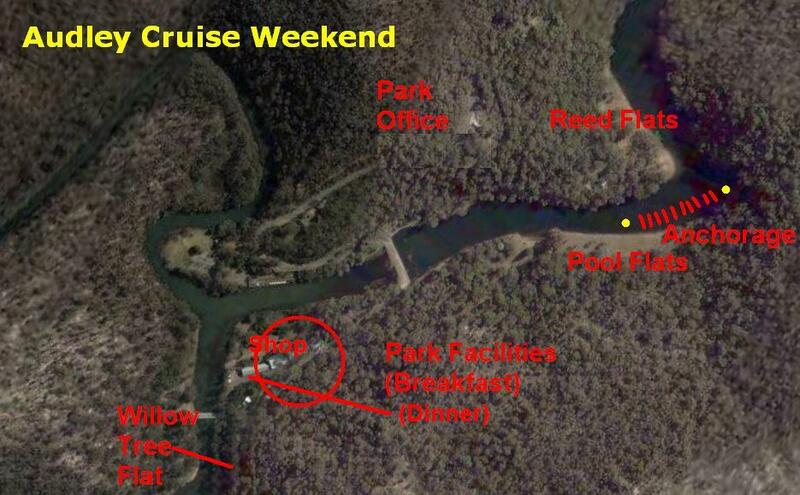 Just thought I would advise of the only Cruising activity over Easter that I was aware of. "Splinter" and "Charade" proceeded to Audley on the tide on Sunday morning. The weather on Friday/Saturday was so iffy that we put the trip off until the sun came out and the rain stopped. 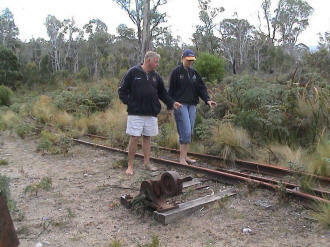 The stay again was a huge success with David and Marianne and myself enjoying the Park. The water was so warm that the three of us spent quiet a while swimming around the river. 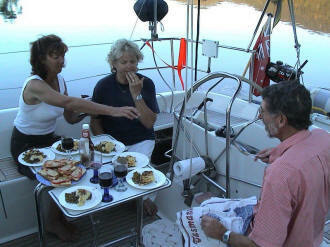 One of the highlights was Sunday lunch, fresh Bream over the Barbeque that was caught at the RM marina Saturday evening. We returned Monday morning with the thought of returning to work for Tuesday. Paul McCann was our quest speaker. Paul has qualifications in Industrial, Plastics, Mechanical and Marine Engineering. He also has Trade certificates in Carpentry, Fencing and Concreting. He has a master 5 certificate. He runs his own business which manufactures Metal Fabrications, Powder Coats and Designs specialised fencing at Taren Point. He also teaches at the Sydney Institute of TAFE. If this isn't enough he holds three consecutive National Titles in of the beach Catamarans. His special subject on the night was "How to take the fun out of Sailing"
The meeting went well and unfortunately we ran out of time for Paul to fully do justice to the subject. Hopefully Paul will agree to continue at a latter meeting. L'attitude has completed her Tasmania Cruise. Emmanuel has also completed a Tasmanian run.